The High Renaissance based in Rome and Venice was the culmination of an ascending movement in art that finally captured the essense of Greek and Roman classicism, even at times exceeding the Ancients' prowess. Idealism, naturalism, the adroit use of mathmematical theory in perspective and proportion, combined with classical qualities of order and harmony, created "classical" moments in painting, sculpture, and architecture. These were moments that "unified and balanced the conflicting experiences of an entire culture." As Florence' influence waned due to changing political conditions in the late 15th century, the focal point of the Renaissance shifted to Rome and Venice. In Rome, the High Renaissance blossomed with the Church dispensing patronage in the sponsorship of grand works in art and architecture. The artistic achievements of Leonardo Da Vinci (1452-1519), Michaelangelo (1475-1564), Raphael (1483-1520) and Bramante (1444-1514) exemplified the Classical spirit that had imbued the works of the Greek High Classical era two thousand years previous to their time. Concurrent with that of Rome, the High Renaissance as it appeared in Venice had a different emphasis than its Roman counterpart. While the High Renaissance centered in Rome concentrated on intellectual themes of virtues, heroics, epics and lofty concepts, Venice had a more sensual outlook with the creation of art that reflected the light and coloration of its seaside landscape. 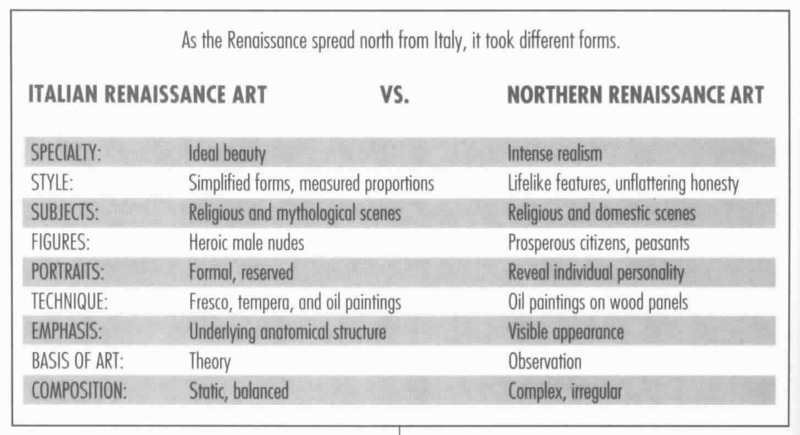 The generation of artists following the High Renaissance were faced with the dillemma of either slavishly copying, or distinguishing themselves, from the masters' acknowledged perfection; the period known as "Mannerism" was this reaction to the glories of the High Renaissance. 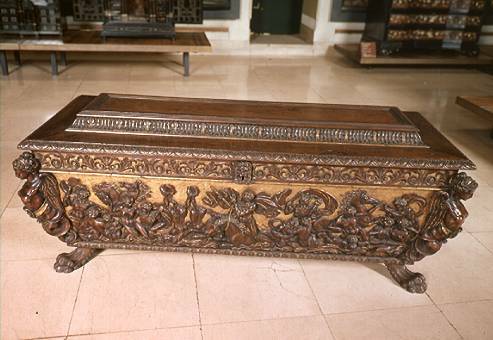 The cassone was an Italian marriage chest popularized during the Renaissance. This example is 16th-century Venetian and features relief carvings of classical scenes. The winged figures on the corners are called caryatids, and the feet of the chest are carved in a shape known as paw feet. Sfumato - smoky, hazy-like tonal blending in a painting typical of da Vinci's "Madonna of the Rocks"
Pediment - a recessed and enframed triangular space of a gable roof end, or as an architectural decorative element over a window, niche, etc. Figura serpentinata - a Mannerist figural representation where the figure is contorted into a nearly-unnatural "s"-shape. Mannerism - stylistic reaction to the perceived "perfection" of the High Renaissance, with distorted emotional figures, acidic colorations, swirls of action around the perimeters; sophisticated elegance.